Beachfront Property – You’ve discovered a place where piercing turquoise waters meet the deeper blue of the sky, and where elegance meets simplicity, and style meets perfect function. Welcome to Villa Bahari, a luxury Caribbean 3 Bedroom, 3.5 Bathroom villa at Shore Pointe at Cupecoy Beach, on the “Gold Coast” paradise of Sint Maarten. 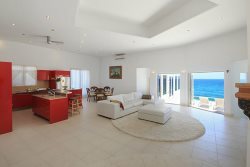 This luxury villa reinvents the standard of refined living and vacationing on St. Maarten/St. Martin. Featuring clean contemporary lines, beautiful high quality decor, generous proportions and open-plan living areas that stay true to the Caribbean way of life. Constructed of reinforced concrete and finished in natural materials, Villa Bahari is as welcoming and carefree as the Caribbean itself. Your experience starts at the front door where your eyes are drawn through the living space and onto an expansive covered terrace that opens to the unabated, breathtaking views of the Caribbean. As you enter the wide-open floor plan and look out to your private pool it is difficult to discern where the pool ends and the Caribbean Sea begins. The pool and deck area has a private direct access to Cupecoy Beach. This is a small clothing optional beach allowing swimming in the clear blue waters. The spacious fully air-conditioned living/dining room offers comfortable, elegant seating and enjoys spectacular views. Indoor and outdoor spaces easily flow into one another which completely relaxes the senses. Warm tropical nights with alfresco dining, outdoor projector for viewing TV, DVDs, WII and XBox games. The pool includes a built in table with seating. The fully equipped kitchen overlooks the dining area and is perfect for entertaining. The main level also offers an office space complete with a desktop computer and printer. And if that is not enough, there is an additional office space on the 2nd floor landing for your use. Master bedroom #1 is on the 2nd floor and has ocean views, a wrap around balcony, huge en suite bathroom with double sinks, walk-in shower and walk-in closet. The king bed has a built-in pop up flat screen TV at the foot of the bed. Master bedroom #2 is on the main floor and has a king bed, French doors opening to the terrace, ocean views, en suite bath with double sinks, walk-in shower, built in TV. Bedroom #3 is on the 2nd floor and has a corner grouping that offers 2 full size beds. It has an en suite bath with double sinks, bathtub with hand held shower and expansive ocean views. 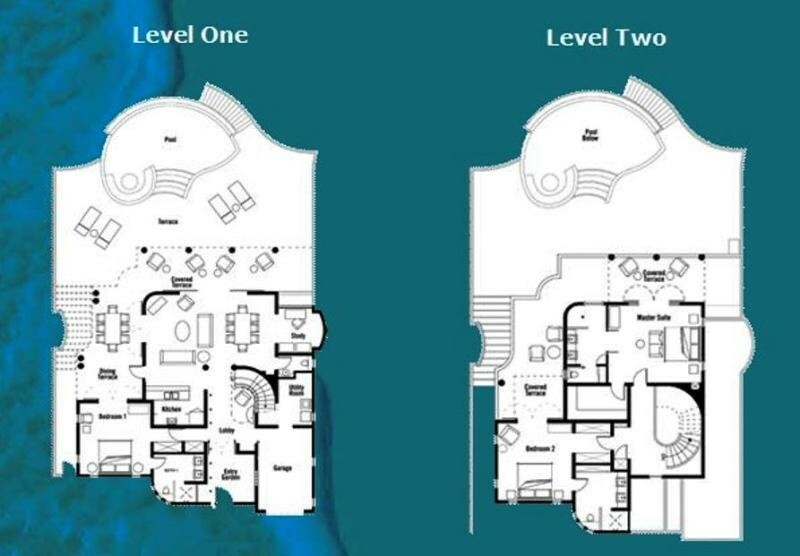 The upper floor bedrooms open to a sitting area and 4 person Jacuzzi on the wrap around balcony. The perfect place to watch the sun set into the soothing waters of the Caribbean Sea from the relaxing hot tub or the comfort of the Dedon Oval Bed. Bahari has been equipped with European designed retractable screens that when open disappear into the side of the door openings to protect the villa from flying insects while casting a soft warm look onto the interior of Villa Bahari. The immaculate kitchen offers granite counter tops and is fully equipped with modern modern state-of-the-art deluxe stainless steel appliances, wine cooler, silverware & accessories and fully equipped for you to make that gourmet meal. Shore Pointe is in the heart of the island’s ‘Gold Coast’ – strategically located on the French/Dutch border – Just a short walk away is Porto Cupecoy with marina, shops and fine restaurants; the new Blue Mall with fine shops and restaurants and minutes to the Atlantis Casino complex with many fine dining options. PLUS the location couldn’t be any better. Close to the airport; dining, shops, casino and nightlife at Maho; the island’s best dining plus casino at Atlantis; the famed La Samanna Hotel and the charming French capital town of Marigot are ALL 10 – 15 minutes away! Come and experience this lovely villa for a taste of the true Caribbean Chic lifestyle right by the beach! Inquire within about pricing for specific number of suites.